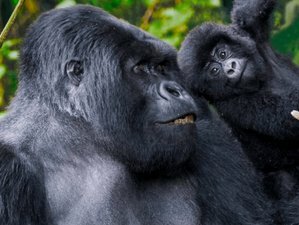 Join this 10-day pearl of Africa safari in Uganda that combines wildlife viewing, chimp trekking, as well as the unforgettable gorilla trekking, all in one package! Take pleasure in this Ugandan adventure where you will visit famous safari destinations, including Murchison Falls National Park, Kibale Forest National Park, Queen Elizabeth National Park, and Bwindi Forest National Park. This safari is a fantastic offer for you to have a close encounter with the African wildlife! During this 10 days safari, you will be accommodated in various accommodations including Marie's Royal Hotel in Kampala, Murchison River Lodge, Kibale Forest Camp, Twin Lakes Safari Lodge, and Broadbill Forest Camp. Today is your arrival day at Entebbe International Airport (EBB) where you will be welcomed by a Mushra Travel Agency staff and transferred to your accommodation in Entebbe. Overnight stay will be at Marie's Royal Hotel, Kampala. After breakfast, you will drive through Kampala City Center en route to Murchison Falls. It’s a long trip; you will make two stops for snacks, lunch, and also make a stop at the Rhino Sanctuary. You will get to Murchison Falls in the late afternoon. Relax and have your lunch with magnificent views of the Nile River. Dinner and overnight stay will be at Murchison River Lodge. After breakfast, the day will start with a game drive on the northern bank of the Nile to look for lions, elephants, giraffes, hartebeest, and different bird species. In the afternoon, you will have a boat cruise on the Nile River for game viewing in the afternoon. Dinner and overnight stay will be at Murchison River Lodge. After breakfast, you will be transferred to Kibale Forest National Park. You will be received by a Mushra Travel Agency representative at the hotel. Dinner and overnight stay will be at Kibale Forest Camp. Today will start with an exciting chimp trekking. Enjoy a guided nature walk in the tropical rainforest in search of the chimpanzee, red-tailed monkey, black-and-white colobus monkey, and many others. You can also opt for the Chimpanzee Habituation Experience. Chimpanzee Habituation Experience offers you the unique experience in which you will spend an entire day with the chimps, follow their daily activities, and learn more about their way of life. Dinner and overnight stay will be at Kibale Forest Camp. After breakfast on day four, you will be transferred to Queen Elizabeth National Park. You will drive through beautiful landscapes and see crater lakes. You will have lunch at 13:00, take a lunch break, and go on a game drive in search of the first wildlife; waterbucks and elephants, including warthogs, buffaloes. Dinner and overnight stay will be at Twin Lakes Safari Lodge. You will start the morning with a game drive. You will search for lions, elephants, buffaloes, and other wild animals in their natural habitat before returning for lunch. In the afternoon, a boat cruise along the Kazinga Channel. Watch out for hundreds of bird species that can be sighted such as elephants, buffaloes, and hundreds of hippos that are cooling off at the shores. This cruise will definitely be one of the highlights of your safari. Dinner and overnight stay will be at Twin Lakes Safari Lodge. After breakfast, you will be transferred to the home of the endangered mountain gorillas, Bwindi Forest National Park. Dinner and overnight stay will be at Broadbill Forest Camp. This is the best part of your safari: a meeting with the mountain gorillas! Expect to walk a long distance in steep and muddy conditions, sometimes with rain overhead before you encounter any gorillas. Dinner and overnight stay will be at Broadbill Forest Camp. After breakfast, you will head back to Kampala, driving through Kampala, Mbarara, and have lunch at Ingongo Cultural Center. This is an active safari with moderate to strenuous hikes during gorilla trekking. Participants must be at least 15 years old and should be physically fit. Each departure is limited to 16 travelers. While tracking primates, guests will trek through the thick jungle at elevations ranging up to 10,000 feet, for as many as eight hours, depending on the location of the primates. Treks can be arduous and the terrain can be steep, uneven, wet, and muddy. This trip is not suitable for those who suffer from a cardiac, respiratory, or circulatory disorder or a disability that limits mobility. Your safari trip will take place in several locations in Uganda including Murchison Falls National Park, Kibale Forest National Park, Queen Elizabeth National Park, and Bwindi Forest National Park. Please book your flight to arrive at Entebbe International Airport (EBB). Transfer from and to the airport is included. Mushra Travel Agency will pick you up from the airport. Mushra Travel Agency is an East Africa based travel agency specialized in gorilla trekking safari, Rwanda tours, Kenya safari, and Uganda safari, among others.